A Little Christmas Charm is more than a little charming! It features Gabby and Owen who work for the same company. From the outset it is clear that they both are hugely attracted to each other. Despite her initial reservations about getting involved with someone at work, Gabby agrees to go out with the charming and very good looking Owen. Their relationship quickly becomes quite intense and rather steamy! Yet, Gabby is holding back on committing properly or even calling Owen her boyfriend. With Christmas on the horizon, she is planning to head off for a week of sunshine as she has often been let down in the past, particularly at Christmas. I felt A Little Christmas Charm gave an unusual slant on relationships as it was Gabby who didn’t seem to want to get to committed and had trust issues, where often in romance novels, it’s the man. As we get to know Gabby more, it becomes clear why she feels this way and why she is very reluctant to trust anyone. It was really quite sad to read about her childhood where she experienced very little emotional support, leading to her fear of being let down. Her rather brittle exterior was a facade she had built up to protect herself from disappointment. Owen was a fabulous character and I really enjoyed reading about him. Quite apart from his obvious good looks and charm, we see through his care for his father that he is a very compassionate and committed person too. It was so frustrating for him and Gabby – and for me as a reader – when events kept conspiring to thwart their plans. Owen kept having to let Gabby down and although for totally understandable reasons, I could see why this was so disheartening for Gabby. Owen felt awful too but he was put in some impossible situations throughout the book. I began to despair that they would get a happy-ever-after. I was so happy to meet up with Faith and Adam from last year’s Christmas novel by Kathryn Freeman, A Little Christmas Faith, near the end of the book. I won’t tell you how the stories connect but it was lovely to find out what had been happening for them in between books. And I loved the way that Adam in particular could see that Owen was one of life’s good guys. The lesser characters in the book all fitted in so well to A Little Christmas Charm from Owen’s ex Stella, to his grumpy Dad, lovely little Zoe and his PA Hilda – even Gabby’s mum showed her better side in the end. 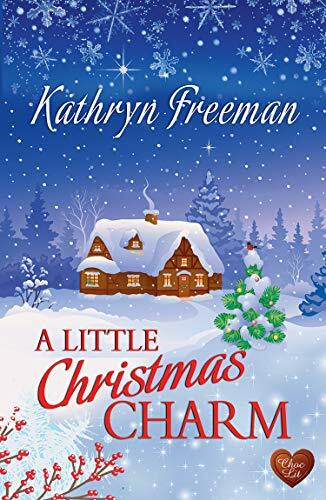 A Little Christmas Charm is another winning story from Kathryn Freeman and is a perfect book to curl up with on a chilly winter’s evening. There is romance and charm aplenty to warm your heart. A book to fill you with Christmas spirit and leave you with a smile on your face. Lovely! Hope you enjoy them Anne. Read A Little Christmas Faith first.